When a Muser uploads their video, it becomes a “Musical,” and other users can leave their comments about it, “like” it, or subscribe to the person’s account so they can see more of their content in the future. Musical.ly encourages connecting your account to other social media apps like Instagram and Facebook, so that those to whom you are already linked can easily find and add you to their friend group on the new app. Among those accounts not set to “private,” Musers can climb their way to the top of in-app popularity charts or be “featured” in a special section on the app, where people around the world can view their Musicals. During Musical.ly’s recent growth in popularity, contests have been held by celebrities who offer prizes for teens who submit the best lip sync to a new song – which of course helps the artist gain more publicity. Finally, two features have added “stickiness” to the app, providing more reasons to keep using it. First is the ability to name one of your followers your BFFs (Best Fan Forever) and to create duets with them. This is where both of you create an individual video singing along to the same song, and then Musical.ly automatically combines it. Second, they’ve added a Q&A feature, where one Muser can pose questions in one video, another Muser can answer them in another, and Musical.ly automatically combines them. This is all in a 15-second clip, which is long enough to draw you in and make you laugh or smile, but short enough to keep from getting boring and annoying. 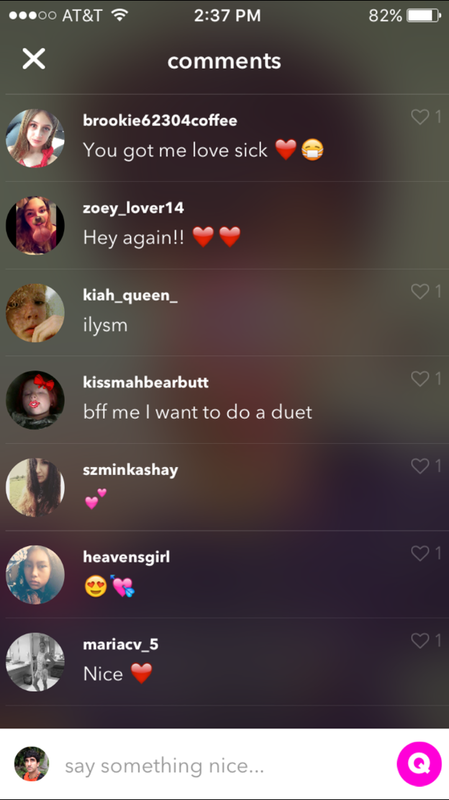 Musical.ly allows kids to interact with others and bond over the music they know and love. Music played a huge role in my life while growing up, as it expressed the feelings and emotions that I couldn’t naturally or readily express as an angst-ridden or love-struck adolescent. To be sure, music plays less of a role in my life now – and I think that trend is evident in the lives of many adults. However, I clearly remember the songs and groups or solo artists I loved back then, and how I wanted to go to concerts, wear band merchandise, get band stickers and posters, and connect with others who appreciated the same genres I did. Music brings people together, lifts moods and emotions, offers solace and reassurance, makes your heart race, provides hope and motivation, alleviates loneliness, and simply makes you feel better. That’s why we listen to it. During my teenage years, music was so huge in my life and in the life of my friends, and I think I would have totally used this app back then as certain songs – for weeks and months at a time – became my jam, my anthem, my mantra. I know I would have wanted to share them in creative, personalized ways with others just to see who could relate to that same music like I did, and just to see whose heart beat just like my own. If Musical.ly was around back then and I was an active user, I am sure that receiving positive affirmation from others after sharing my videos would have brought a smile to my face and a skip to my step. It would have provided validation and connection – two things I desperately wanted and needed as an adolescent. Musical.ly complies with the Children’s Online Privacy Protection Act (COPPA), which means that it is unlawful for children under 13 to have an account and operate it on their own. However, just like on any social media site, there will always be cases in which children lie about their age in order to create an account. Musical.ly tries to control this by monitoring its accounts and investigating any suspicious activity to which they are alerted. Parents who are worried that their child under the age of 13 has an account may contact Musical.ly directly at [email protected] so that proper action (which includes deletion of the account) can be taken. While there isn’t a demographic breakdown available, it appears there are so many This said, the reality is that there are many, many tweens using the app. I spent a few minutes showing it to my wife so she was familiar with how it worked, and we were amazed as to how many Musicals were made by children who looked like they were 8. A recent article refers to the app as the “first real social network that has reached an audience as young as first-graders.” I don’t really want to get into the weeds of the proper age when a parent should give their child a smartphone, but the reality is that increasingly younger kids are getting them t. The other reality – and one more stark – is that all of the work I’ve done with young kids reminds me that many simply don’t demonstrate the kind of wisdom and discretion we would like to see with regard to what they post. 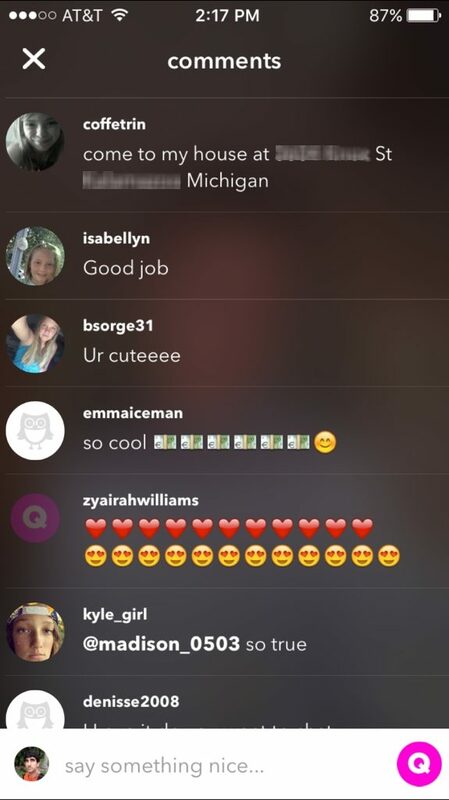 Specific to Musical.ly, in the Comments section of Musicals created by obvious elementary schoolers, phone numbers are exchanged (I blurred out the one in the screenshot below), and kids are invited to call/text one another (and even drop by the house – I had to blur out a home address, see below!). 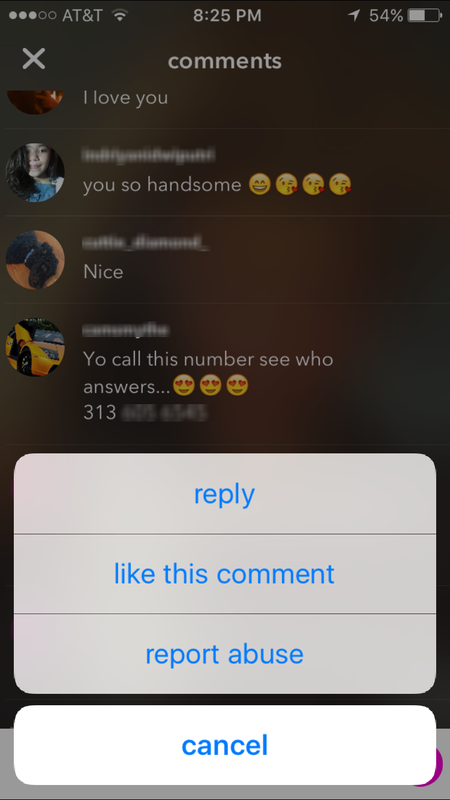 These aren’t private messages – I could call/text these kids right now. And hopefully they are kids, and not adults with perverse/malicious motives. At the very least, I can easily connect with them through the app and through the contact info they typically share in their profile’s short bio (often including their Snapchat and/or Instagram username). Please know that my goal is not to frighten (we *hate* fear mongering and are frustrated by those who continue to create a moral panic when it comes to what teens are doing online). I just feel obligated to point out that very young kids – when given the power to contribute to and interact on a thriving platform dominated by other young kids – are making mistakes that cause adults to cringe. Just download the app, scroll to find a Musical by someone who is way too young, and look at the comments. They are kids. They are not thinking this through. They simply want to connect with others, and long for shoutouts, hollabacks, BFF status, being Featured on the site. They request each other’s Snapchat or Instagram or email or phone number just so they can extend or deepen the connection and conversation. There are also a lot of “OMGGGGG I love you so much!!! !” and “Marry me!””” and “Snapchat MEEEE! !” and “MSG me!! !” It’s natural and emotional and very “in-the-moment.” But it’s unregulated madness, and it makes me slightly nervous. Slightly. Another concern for some parents whose children use Musical.ly is the presence of mature themes in the songs that other Musers include in their Musicals. This includes, but is not limited to, profanity and sexually-offensive statements. Users may also be exposed to videos of other Musers that depict sexualized behaviors, dance moves, revealing clothing, or other content that may be inappropriate for young eyes and ears. Furthermore, because Musers are encouraged to leave comments on videos, there is a chance that children may be bullied or ridiculed for what they’ve created. Plus, when they agree to upload content to Musical.ly, all Musers grant permission for their content to be shared on other social media sites regardless of whether they know it or not. 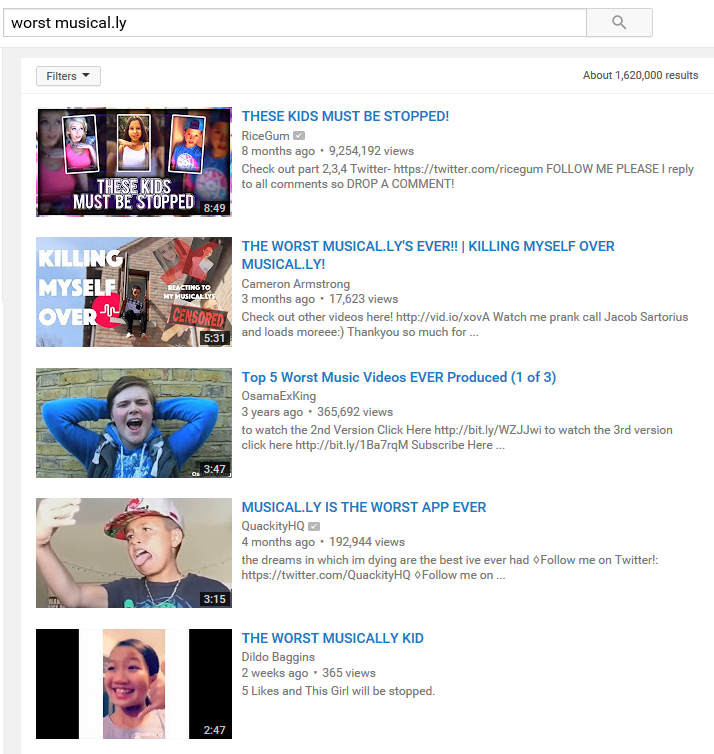 When some Musicals make their way onto YouTube or Facebook, they tend to be received harshly and face a significant amount of ridicule and mockery by the masses of people on those social networks. Those kids made their short video clips with the best and most innocent of intentions, but don’t realize that they will be put on blast by a comparatively heartless peanut gallery of critics. Finally – and this may be a stretch but undoubtedly does happen sometimes – those on any social media app are possibly at risk for being contacted by someone with malicious or perverse motives. This risk is escalated on Musical.ly if a child’s privacy controls are set to allow for their location to be shared. If shared, a Muser is presented with a list of other Musers in their area (within a 50-mile radius of their location) with whom they can reach out and connect. This has its benefits, of course – to make new friends and add to one’s peer group those whose personalities and styles and talents and tastes in music you appreciate. However, we’re all familiar with the possibility (though rare) of online predators. It is easy to find a number of young kids – in elementary and middle school – who live in one’s area simply by clicking on the “my city” option to display who lives around you and is on the app. Perhaps these children simply haven’t been instructed to disable location sharing because of the potential for victimization. Or, perhaps they immediately reject, block, and report anyone who appears or acts weird or creepy to them. I’d like to believe this. Overall, I think we need to give our youth more credit for keeping themselves safe in wise ways, even though there will always be a handful who mess up. 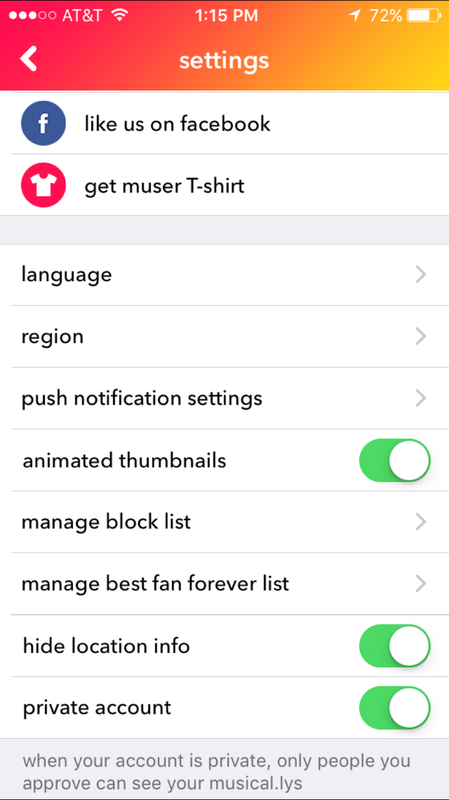 With regard to user control settings, Musers are able to choose if their videos are private and viewable only by their approved followers, or shared publicly – which allows anyone to access their profile and consequently see their videos. They can also control who can directly message them, as well as whether their location is published or not. Additionally, once a Muser makes an account, there is no option for them to delete it (I’m not making this up), unless Musical.ly itself has to do it due to a violation to their guidelines. Just like other social media sites and apps, there is nothing inherently bad about the Musical.ly (although the unfettered fan-boy and fan-girl culture that is being created and encouraged among very young kids concerns me). I’ve really tried to summarize it in a way that points out its beneficial aspects, and underscores why it is growing in popularity. As with any variation of social media, adults simply need to take the time to become familiar with its features and functionality, understand the privacy controls that are at the disposal of users to control who communicates with them, and convey the importance of exercising sound judgment and discretion in terms of how we interact with others. Some kids still don’t know how to do this yet. Some kids do. Parents and educators must remain calm, involved, and available to youth as they embrace Musical.ly and other apps that come down the pike. We hope that most tweens and teens, by and large, are “getting it” through the education and awareness-raising initiatives they’ve gained through the years. We hope that the lessons are sinking in, and not going in one ear and out the other. However, we would be wise to remember that the instruction and reminders should never let up. Musical.ly is worth a specific conversation with the elementary and middle schoolers under your care, so that they understand how to use and enjoy it without making a mistake that renders them vulnerable, and eventually catches up to them. Excellent article about Musical.Ly. A lot to consider about the dangers of this ap when used unwisely, particularly among very young children. Thanks, Dr. Hinduja. Please email us screenshots and we will route it to our contact at Musical.ly. You may also want to consider whether Musical.ly is the best venue for your daughter if she’s experiencing a lot of hate and harassment there. Sometimes, we can’t control the behavior of others, and we need to find a new space in which to hang out. There is an acct user who is a huge bully towards others. Not just here but in school. What can be done to put an end to this bullying? I would like her acct deleted due to bullying comments toward so many users. I love the article. Musical.ly grew so much for 3 years. There are so many children using the app. Every parent should read the article to become aware of the dangers of Musical.ly and how to prevent them! Thank you for addressing the dangers of this app when used by children and adolescents who don&apos;t have a clue! You have certainly opened my eyes to the dangers posed when kids are given little or no supervision regarding cell phone usage and I will be on the lookout for any problems from this point forward. Thank you for this. I&apos;m hoping this gets more and more monitored with time. My heart breaks reading the comment section on so many of these new "muser" celebrities. 13 year olds becoming stars overnight. Kids can be mean, this is nothing knew. But now they get to bully each other online behind the safety of theirs smart phone screens, and it&apos;s ugly. Found out tonight my 8 year old daughter created an account and has over 500 followers. Most older men creepy. She lied about her age to get on the app. I can&apos;t tell you how many kids under the age of 13 are on this app dancing in ways they shouldn&apos;t be, raising their shirts up, pulling their shorts down. Was very disturbing by all means and most of these settings shouldn&apos;t be allowed. If the app is designed to share music and videos then that should be it. Not to share location ECT. I&apos;m one kissed off dad that the owners are gonna hear from and also gonna file a motion to the courts to have this looked at more closely. My daughter has started to hear her name being called out in her videos, it is freaking her out, but when I watch the same video it doesn’t happen. Is it possible for her account to be hacked by a predator even if it’s on private? I&apos;ve been trying to get a hold of musically to get them to disable/delete my daughters account but have not gotten any response (I&apos;ve send email to legal, privacy, info and even sent a fax). Is there a number I can call to talk to a human? Any other advice? I&apos;m going to forward your info to our Musical.ly contact. Hopefully this can get sorted ASAP. Stay tuned, Charles. My child also created an account that was hacked by an ex friend. I have tried everything to get it taken down, we have left lots of reports but nothing is getting done. Is there any way of contacting tiktok / musical.ly because I can’t find it!